Walking along a Northumberland beach one sunny winter’s afternoon I was struck by the patterns and colours in the sand where a small stream emptied on to the beach, fanning out towards the sea like some miniature estuary. 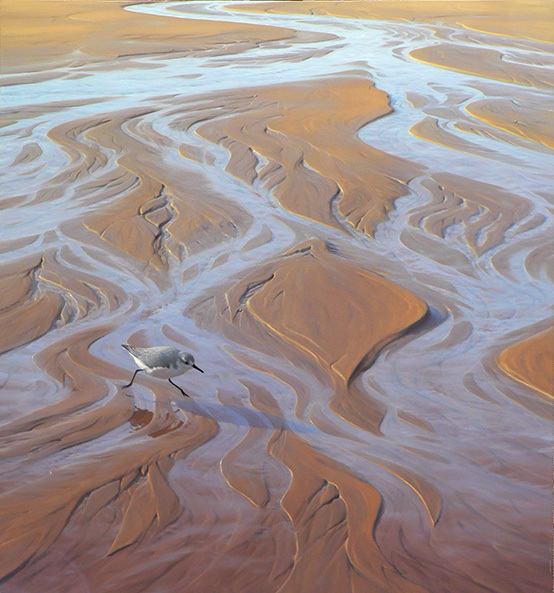 Sanderlings scurried along the beach as I sat painting the field sketch, so i put one in the picture. They move so fast it appears as though their feet barely touch the sand, so I depicted this one in mid-stride, completely clear of the ground.